I bought a Tessa Nova from Peter last summer after attending the Montreal Guitar show. I already had a Hopkins Monarch which I love, so I when I went to the show I was interested in meeting Peter and seeing his other guitars. When I approached his table the first thing that caught my attention was not Peter, but the ABSOLUTELY GORGEOUS Tessa Nova he had on display. I admit that the first thing that caught my attention was its looks. There were lots of people oggling the thing, me included. When I played it, I was sold. The neck felt super. The tone of the guitar unplugged was woody, airy. I liked it immediately. I played it on and off over the next couple of days. For my tastses and needs, it was clearly one of the standout guitars at the entire show. Its got a super feel up and down the fret board. It and I just connected. So I got it. And I love playing it - a lot! Okay, this time I actually opened the box as soon as it arrived and was thrilled to discover it contained the most beautiful guitar I've ever seen!!! WOW WOW WOW! You out did everything that has come before with this one. You're workmanship is miles ahead of the rest of the pack and I have no doubt that the instruments you're making now will be BIG dollar sought after collectibles in the coming years. This guitar is nothing less than stunning! A piece of art with strings! I've only played her for about 30 minutes and but was instantly taken with the tone and acoustic volume. Really impressive -- better than anything I've ever played. I'm also amazed at how light it feels every time I pick her up. The tone is so amazing! I’ll be playing my Tessa Nova all day and all night. Thanks, Peter, job well done!. "I new that your guitar was going to be an piece of art. It is soooooo beautiful!!! The pictures cannot do it justice. And the level of craftmanship, the very high quality work of lutherie and the choice of very high end wood pieces are out of this world. And then I picked it up. The first thing I felt was, wooo, this is feather light... Very surprising... But no surprise to the fact that this is much more then a pretty (very pretty) face... It is a true musical instrument! It vibrates like an acoustic guitar. Actually unplugged, it does sound as an acoustic guitar. We are light years in front of dead wood archtops that don't ring and are dead sonically that you find around... This guitar is alive! You can quote me anytime my friend!!!" "WOW!!! And wow,wow,WOW!!! 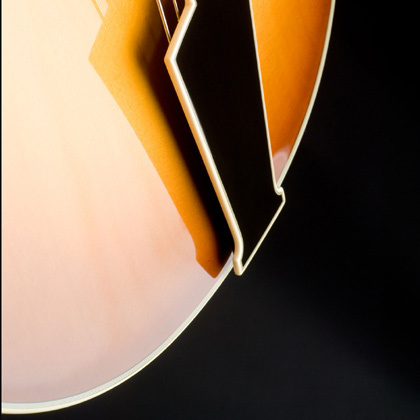 - the Regal is one beautiful guitar. Incredible looks, workmanship, playability, detailing and that perfect blend of electric and acoustic tone that's the mark (in my humble opinion) of a great jazz box. My wife, who never looks twice at my guitars, said it's her favourite. The quilted maple is eveything I hoped for, as is the playability. The whole package is STUNNING!!! Neck profile is perfect too! Love this guitar!" "So beautiful, gets better every day, I keep discovering new things about it. It plays beautifully and contains many songs waiting to pop out." "I have been a jazz guitarist for over forty years. I just purchased a Contessa from Buffalo Brothers Guitars in North County, San Diego. At first, I was put off by the "plain-ness of the finish and the lack of bindings. Not your issue, mine. Old habits, I guess. As I played it at home, it grew. So much that now I think I could put it in a planter and it would grow roots. This is the most organic guitar I have ever played. I thought my 'muse' had left me, but now it's back, in the form of the Contessa. I have barely put it down since I purchased it. I'm 62. Sometimes I look at it and it looks like a Japanese primitive instrument.